Wow; what a beautiful movie. Small, unassuming, quiet, still. Dramatic because it is completely prosaic. A 10x10' world in which time stands still. An Irish/Canadian co-production, filmed in Toronto. It was not quite as great as I had heard, expected, or hoped, but it's riveting nonetheless. 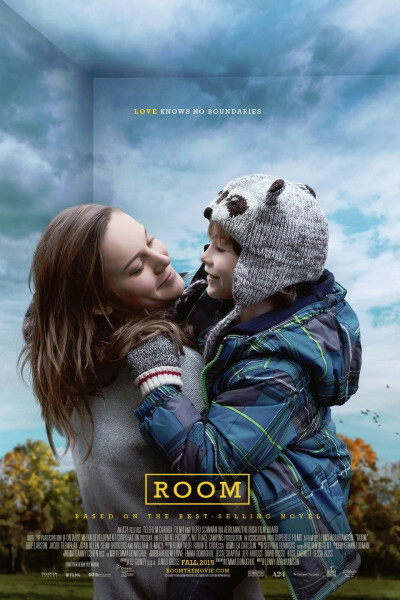 Brie Larson will surely be nominated for an Academy Award, and nine-year-old Jacob Tremblay is, in a word, amazing. If nominated, he'll be the youngest since Jackie Cooper in 1931. His bottomless and telling eyes, elfin grin, and that hair. He simply melts your heart again and again and again. I watched him for two hours and it felt like a blink. Room will change your perspective, both grand and granular, and you'll see rooms anew for a while, I suspect. "Hello, chair 1. Hello, chair 2." Do catch it if you can. Unlike, say, 12 Years a Slave, it won't quite burn you to your seat, but you'll be seared deeply by it, and all the more grateful if you're not already.